Half the fun of iPhone photography is editing and altering your photos in various photo apps. And now that Apple has introduced its iPhoto app for the iPhone and iPad, bringing its desktop photo management and editing software to the touchscreen interface, users have a great, all-in-one photo-editing tool at their fingertips. iPhoto is one of the most packed and powerful iOS photo apps we’ve seen, so there’s a slight learning curve when using it to spruce up your photos. 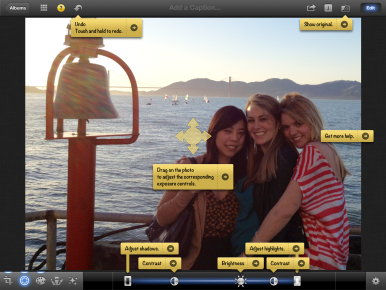 Here’s how to use some of the app’s tools to make basic edits. Instructions are based on the iPad version of iPhoto for iOS, but it's easy to extrapolate the same techniques for the iPhone 4 or 4S. To enter Edit mode, tap the Edit button in the top right corner while viewing a photo. An editing toolbar will appear on the bottom of the screen. While you’re editing, it’s helpful to get the most from your screen space. To remove the thumbnails from view and get a full-screen view of the image you’re editing, tap the thumbnail icon (which looks like a grid), in the top left corner next to the Albums button. This makes the screen less cluttered and you’ll be able to focus on editing your photo. 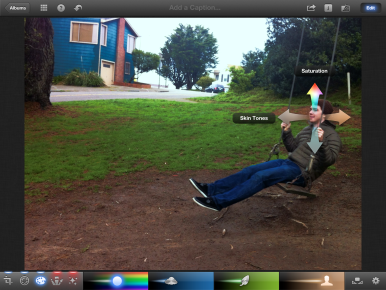 On the left of the toolbar, you’ll find iPhoto’s Multi-Touch editing tools. You can crop and straighten photos, adjust exposure, change an image’s color balance, and more. These tools are organized in an intuitive order that’s generally how you’d approach editing an image. When you tap one of these tools, the middle of the edit menu will change depending on what tool you select. For instance, if you tap the Crop and Straighten button, you’ll see a dial that you can tap and drag to interactively straighten your photo. After a tool’s edit has been applied, a blue glow appears above that tool. To go back to the original edit menu, double tap the button of the tool you are currently using. Start editing: You can view the entire edit menu below your image by tapping the Edit button on the top right corner. At any point while you’re editing, you can tap the Gear icon on the lower right corner to adjust the settings of the tool you’re using. When you’re not using a specific tool, you can tap the Gear icon and find buttons to Copy Exposure, Color and Effect; Paste Exposure, Color and Effect; and Revert to Original. If you ever forget what a certain iPhoto button does, you can always tap the Help button (the question mark), located in the main menu at the top left, at any point and the app will reveal labels and instructions for its tools. Most photos don’t need much before you can share them with others, post them to Instagram, or use them in an iPhoto journal. The fastest way to give your photo an all-over edit is to use the tools available in the middle of the edit toolbar. Unlike iPhoto ’11 (the Mac version of the app), iPhoto for iOS features only two quick-fix edits: Rotate and Auto-Enhance. Rotate does exactly what its name states: It rotates your image in 90-degree increments. If you’re loading photos from your digital camera onto your iPad, you might have quite a few photos that need rotating. By default, the Rotate tool turns your photo clockwise. To rotate your photo counterclockwise, tap and hold the Rotate button until a menu opens and then tap Rotate Counter-Clockwise. This will change the default rotation to counter-clockwise until you change it back to clockwise via the same method. Like Enhance on iPhoto ’11, Auto-Enhance lets the app do all of the editing magic. Tapping the button will automatically adjust the exposure and colors of your image so it looks its best. Most of the time the results are great. But if you don’t like what Auto-Enhance has done, you can always tap the Undo button in the top, main menu. To see exactly what iPhoto has done, you can tap on the Exposure and Colors tools (using Auto-Enhance will make both of these tool buttons glow, notifying you that an edit has been made). Perfect the frame: When you use the Crop and Straighten tool, you'll see a straightening dial at the bottom and a three-by-three grid overlay for the Rule of Thirds. To crop your photo use the pinch-to-zoom gesture. 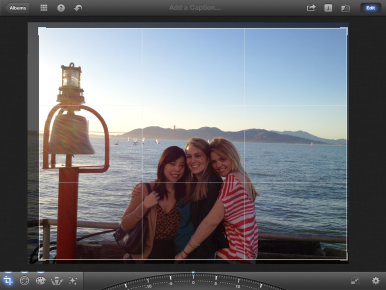 A grid will automatically overlay on top of the photo, letting you crop according to the rule of thirds, if you like. If you used the Auto-Enhance tool, but aren’t totally satisfied with the results, you can make changes by going to the Exposure tool in the editing menu. The Exposure tool lets you adjust shadows, contrast, brightness, and highlights. When you tap the Exposure button, you’ll see a slider appear in the middle of the toolbar. There are two ways you can adjust the image: You can use Multi-Touch gestures directly on the image or you can adjust the slider itself. Tap and hold an area of your image and the corresponding exposure controls will appear. For instance if you tap and hold a shadowy part of your image, you’ll see arrows pointing up and down to adjust Shadows, and arrows pointing left and right to adjust Contrast. You can then swipe your finger up and down or left and right to adjust these controls. Help with exposure: When you're using a tool, you can tap the Help button for instructions. In the Exposure tool, you'll see how to make adjustments via Multi-Touch gestures or the slider. Often, it’s hard to find the spot in your photo that will reveal specific controls when using Multi-Touch gestures. This is where the slider helps. You can adjust highlights just by sliding the far right control to the left or right. Moving the highlights slider more to the left darkens the highlights in your photo. Sliding the contrast circles further away from each other creates more contrast. Sliding the brightness control more to the right makes your photo brighter. And finally sliding the shadows control more to the right lightens the shadows in your photo. The Color tool makes it possible to adjust the color balance in your photo. As with the Exposure tool, you can alter the color using Multi-Touch gestures or by simply sliding the four sliders—Saturation, Blue Skies, Greenery, and Skin Tones—in the edit menu. For basic edits, Saturation is probably the only adjustment you need to make. This will add more or decrease the overall richness of color in your image. Color me perfect: The Color tool lets you make color changes to your image. For instance, when you tap and hold on someone's face, you'll see the ability to adjust Skin Tone color and Saturation. You can also quickly change the white balance of your photo with the White Balance button. Once you tap the White Balance button, nine icons will appear, each representing a different lighting environment. The first option is to keep the original white balance of the photo. Other options include Sun, Cloudy, Flash, Shade, Incandescent, Florescent, Face Balance, and Custom. The Custom option brings up a magnifying loupe that lets you select a white or neutral color in the photo, and the app will adjust the rest of the color accordingly. Under the Gear icon, you can switch the Preserve Skin Tones button on or off to adjust a photo's colors without affecting skin tones. Once you’ve made your basic edits and are satisfied with the results you can exit out of Edit mode by tapping the Edit button at the top right. The edit toolbar will disappear and you’ll be back in Viewing mode to see your newly edited photo. iPhoto for iOS can do much more than basic edits as well. Stay tuned for future how-to articles that will cover specific editing features, such as the Colors, Brushes, and Effects tools, more in depth.